We know Samsung will be unveiling a new tablet at CTIA later this month, and all signs point to their showcasing an 8.9" Galaxy Tab. The same number, 78910, which was displayed in a promo last week, has appeared again on a new image posted on the manufacturer's Facebook page. It will almost certainly be measured at 8.9" because Samsung debuted the first major Android tab at 7" (the original Galaxy Tab), and has announced a 10.1" model (the Galaxy Tab 10.1) - leaving 8.9" as the likely proportion of the upcoming slate. 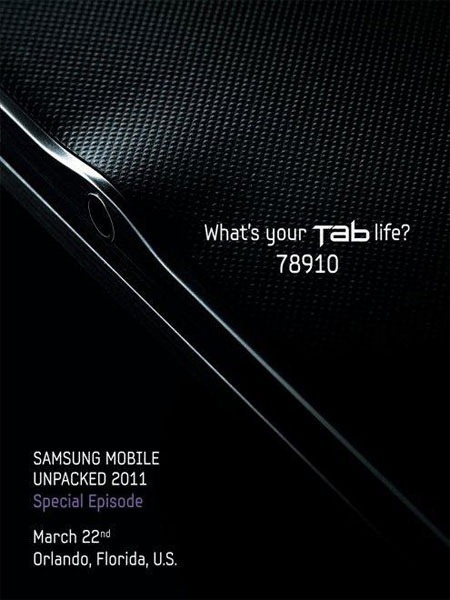 Asking us again "What's your Tab life? ", the visual shows an extreme closeup of a tablet with a cross-hatched texture that looks quite thin. You can expect the svelte tablet to be announced and previewed on March 22 at CTIA, so mark your calendars.